Junior Chamber International (Cebu-Mactan Channel) presents Run To Lead, a fun run project for the benefit of the award-winning program Read to Lead which aims to develop and improve the reading skills and habits of school students ages 10-12. Under the program, we will donate books to each beneficiary school. There will be a monthly activity geared towards sustaining the intensity and the impact of the program. 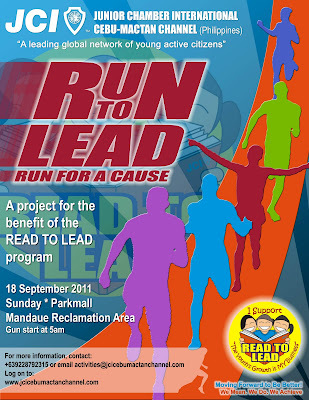 Run to Lead fun run will start on September 18, 2011 (Sunday) at Parkmall, Mandaue City. Gun will start at 5 AM. Same day, same venue at 10:0 AM, a Blood Donation Campaign in partnership with Philippine National Red Cross will be held.